I have shows this Friday in Walnut Creek, this Saturday in Benicia and on Friday the 19th in Camarillo. This fine series features three songwriters in the round every couple of months. I will be sharing the stage with my friend, Laura Zucker, and Mark Lemaire and Twilight. I have had the pleasure of sharing gigs with Laura before -- her clear, powerful vocals, compelling song-smithing and melodic guitar work always knock me out. I have not played with Mark before, but I have heard great things about him. It should be a wonderful evening of music and friends. I will be opening for the legendary songwriter Richard Berman at this renowned concert series in Camarillo. 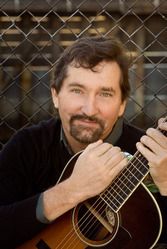 Richard has won numerous songwriting contests over the years and according to the late Utah Phillips, Richard "has the gift". Doors open at 7:30pm and the show will start at 8pm. One of the hardest things for me in music is learning to play less. I often fight the urge to fill every space with the busy-ness of notes. In fact, there is something so moving about the open silence in between, like a white wall surrounding a work of art, that lets the remaining notes stand out and penetrate. I am learning that, more often than not, "less is more". As hard as that lesson is to learn in music, it is even harder to apply in my life. When I returned from the Southern California/South Bay tour with my friends Chris Kokesh and Peter Andrews, the emails were piling up, and I could barely see the wood of my desktop under the papers. I felt a knot in my stomach, the knot of "have-tos". It was as if some invisible teacher stood over me with a wooden ruler, commanding me to work harder, not be such a slacker. Over the next few days, I slowly got through the emails, but many of them turned into lines on my "to do" list. Returning home reminded me how much I pack into my time and load into my days. On the cross country tour in September, I often felt a sense of lightness. We had one place to go to, one gig to play each day. It wasn’t always easy, but it was simple. Back home staring at the list, it hit me that the most important item was missing — the one that said; "Slow down, and make some space." So this month I am taking it a little easier. Fewer gigs. Shorter newsletter. And not feeling like I have to complete every item on my "to do" list. I gently remind myself that I am not just what I do.